December is the most popular month to pop the most magical question, and this means that the season’s must-have gift is obviously an engagement ring. But whether you drop on bended knee during the seasonal festivities or you propose marriage as the ball drops to usher in a New Year, you’ll need to plan an unforgettable holiday proposal. That life-changing moment better be Instagram worthy, too, because the perfect pic is priceless. The month of December is brimming with holiday magic. Hanukkah, Christmas, Kwanzaa and New Year’s Eve are all celebrated during December, but there’s also Boxing Day, Yule, Omisoka (a Japanese end-of-year holiday) and St. Lucia Day (celebrated in Sweden), too. All of these holidays have their own unique traditions. And while every holiday might be ideal for a proposal, they all contribute to the general magic and sacred celebrations of December. But how should you propose during the year’s most festive month? Should you infuse the entire proposal with holiday fun? Or should you keep it simple, understated and elegant? Whether December in your part of the country is chilly or warm, there are so many ways to create a perfect engagement that embraces your personal love story and celebrates the magic of the season. If your holiday shopping list includes an engagement ring, here are 40 amazing proposal ideas that serve as the perfect backdrop for popping open that ring box. 1. Plan seven days of hints during Hanukkah. Sure you bought a huge gift, but save it for the eighth and final night! Instead, build up your proposal with seven gifts that provide subtle hints of the proposal. Seven gift ideas: a package of birdseed, champagne flutes, something blue, something old, flower seeds (symbolizing a bouquet), a plate (symbolizing the one for your mothers to break), and a bottle of thyme (to reference your forever future together). 2. Plan a holiday scavenger hunt. Hide holiday themed clues that lead to the ring. Clues can be hidden in stockings, under the tree, on mistletoe or anywhere! 3. Go on a sleigh ride. 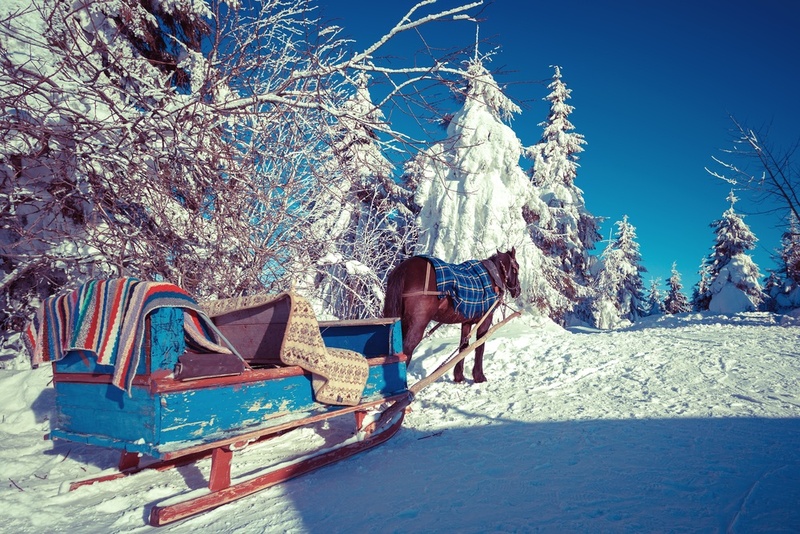 Take a sleigh ride with the future spouse and propose under the stars. Don’t forget your blanket…and maybe some hot chocolate. 4. Write it down in snow! Celebrate the first major snowfall of the year by popping the question. Have a snowball fight and write your proposal in snow! Just don’t drop the ring! 5. Propose by the fire. 6. Hide the ring in a stocking. Did your future betrothed think all the gifts were gone? Oh, there’s one more left! Hide that big gift in her/his stocking for a sparkling surprise! 7. Wrap the perfect present under the tree. Opt for a traditional Christmas proposal by wrapping the ring and placing the gift under the tree. But don’t make that gift easy to unwrap! Use layers of paper to make this gift one that doesn’t come unwrapped so easily. Or hide the ring box in a larger box; bury the ring under layers of paper stuffing and packing peanuts! 8. Take the proposal…on ice. Head to the ice rink and celebrate the night skating to holiday music. Propose on the rink or somewhere secluded and special. 9. Seal it with a kiss. Take that perfect proposal under the mistletoe! Festive…of course! Plant the perfect kiss and then propose! 10. Propose by the light of…holiday lights! Stroll through a holiday light display, and choose your favorite display to drop on bended knee. This is a great backdrop for an Instagram post, too! For many couples, marriage holds serious spiritual significance. Propose outside of your church, temple or synagogue after a special holiday service. 12. Bake up a sweet proposal. Holidays mean lots of baked goods…and cookies! Or gingerbread houses. If you’re getting your bake on, plan your proposal around the sweet setting. Bake up gingerbread characters and then place the ring on the cookie’s hand. Or place the ring on top of a gingerbread house. Use your imagination to craft your own delicious proposal. Just make sure your true love doesn’t eat the ring! 13. Celebrate the 12 Days of Christmas. Theme your proposal to the 12 days of Christmas! Yes, this means giving gifts inspired by all the days from the song. You can get literal—five gold rings (opt for tiny thin bands that can be worn stacked on the hand!). But also opt for silly gifts, too (seven swans a swimming could be seven pool float swans!). Present the big gift on Christmas Day. 14. Present the ring at a holiday party. Heading to a holiday-themed formal party? This could be a perfect proposal opportunity. When both of you are dressed to the nines, take the opportunity to put a ring on that finger! Bonus: formal attire makes for extra swoon-worthy social media engagement snapshots! 15. Propose underneath the falling snow. Propose in the snowfall. Not only does the falling snow make for a romantic and serene backdrop, but it’s also a fantastic photo op. Again, though, don’t drop the ring in the snow. The Nightmare Before Christmas is the darker side of the holidays, but who doesn’t love the sweet romance between Sally and Jack Skellington? Embrace the goth festivity by making Jack and Sally the center of your proposal; cue up the movie, serve up Halloween themed treats then propose under the light of the moon. 17. Place the ring on Frosty’s nose. Build a snowman and place the ring on the tip of Frosty’s nose. Or have the ring box open on his stick hand. And be careful with that ring! 18. Get engaged at a holiday concert or ballet. Heading to see The Nutcracker or a holiday-themed symphony orchestra concert? Plan to propose after the performance or during intermission. 19. Propose on Christmas Eve. Don’t want to be too obvious with the holiday proposal? Opt for a Christmas Eve engagement. Pop the question by the tree or somewhere else with special meaning. 20. Plan “A Pink Nightmare” proposal. Do you love “A Christmas Story?” Go a little out-of-the-ordinary and plan a themed proposal. Dress in a pink bunny costume, present her ring under the light of a leg lamp and don’t forget dinner at a Chinese restaurant! 21. Ask right before midnight on New Year’s Eve. Save the best for last—literally—by proposing the minute before the New Year. 22. Or ask on midnight on New Year’s Day. Technically, this pushes the proposal outside of December, but it’s still a holiday proposal! Usher in the New Year by taking your relationship to a new level! 23. Write the proposal on massive poster board cards. Channel everyone’s favorite scene from “Love, Actually” and propose outside his/her door with big poster board signs. Opt for the exact lines from the movie, or write your own. Don’t forget the portable radio with holiday carols! 24. Present that ring dressed as Santa. Go full-on festive and dress as Santa Claus! Yes, this idea plays slightly cheesy, but if this fits your sense of humor, then the idea will work! Have the ring hidden in Santa’s bag, of course. 25. Propose under the stars. Take the proposal under the stars on any special day in December. Sealing an engagement under the heavens is symbolic and romantic. But be sure that you choose a day with meaning. This day could be religious in nature or one that coincides with a moment or memory of your relationship. 26. Or ask that question while decorating the tree. Sometimes the most festive day of the year is when we bring out the decorations! 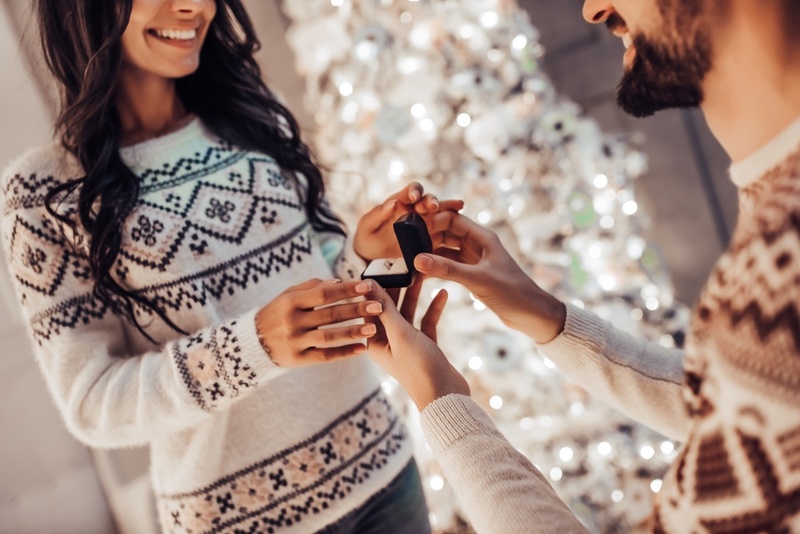 Propose after you’ve decorated the tree or pop the question when she/he places the final ornament on the tree—personalized, of course, with an engagement message! 27. Get engaged while walking in a winter wonderland. Head out for a wintry walk through the snow. Propose under snow covered trees for a sparkling backdrop. 28. Or right at midnight on Christmas Day. Usher in the first minute of Christmas by proposing. Stay up through the night watching traditional holiday movies and romances. Then plan that special moment just as the clock is about to strike! 29. Go shopping and propose at the jeweler. Plan a shopping trip under the guise that you’re checking off your gift list. But instead head to your favorite jeweler and let your future betrothed choose the dream ring! 30. Ask at a family event. If you’re both family-oriented, then plan the proposal during a holiday gathering with family. Or plan for both families to be in attendance to make it extra special. 31. Use the proposal to create the perfect holiday card. Capture that bended knee moment the instant it happens by planning a holiday card photo shoot. Then send that perfect card to everyone on your list! 32. Pop the question over holiday lattes. Fall is PSL peak season but winter means candy-cane themed goodness. Propose over holiday lattes at your favorite coffee shop! 33. Or while sipping hot chocolate. Don’t like coffee? Opt for a proposal sipping peppermint or traditional hot chocolate! 34. Give the hand extra bling before leaving for that New Year’s Eve bash. Let her wear that new bling out for the New Year’s Eve celebration and propose before you head out for the night. Just be sure the ring is already insured. 35. Schedule a low-key proposal brunch on New Year’s Eve. Want to catch your beloved off guard for a surprise proposal? Instead of waiting for a big New Year’s Eve bash to propose, opt for a low-key romantic brunch for that special moment. 36. Watch the ring sparkle while stringing lights. After decorating your house with festive lights, flip the switch and propose outside of your own display. 37. Head to Santa Claus, Indiana. Propose at Holiday World in Santa Claus, Indiana! This proposal infuses every holiday into one fun-filled theme park! 38. Or propose at Rockefeller Center. If you’re able to travel for a holiday proposal, head to New York and propose under the huge Christmas tree in Rockefeller Center. Of course, you also should schedule to see The Rockettes perform at Radio City Music Hall at the Christmas Spectacular! 39. Ask the question while hunting for the perfect Christmas tree. Is there a better time to pop the question then when you are picking out that perfect tree? Of course not! Many farms have backdrops for photo ops, too! 40. Grab the kids and schedule a family-friendly proposal aboard The Polar Express. Plan your trip on The Polar Express for a truly whimsical holiday proposal. This is the perfect proposal idea for couples who wish to include their children into this special day. 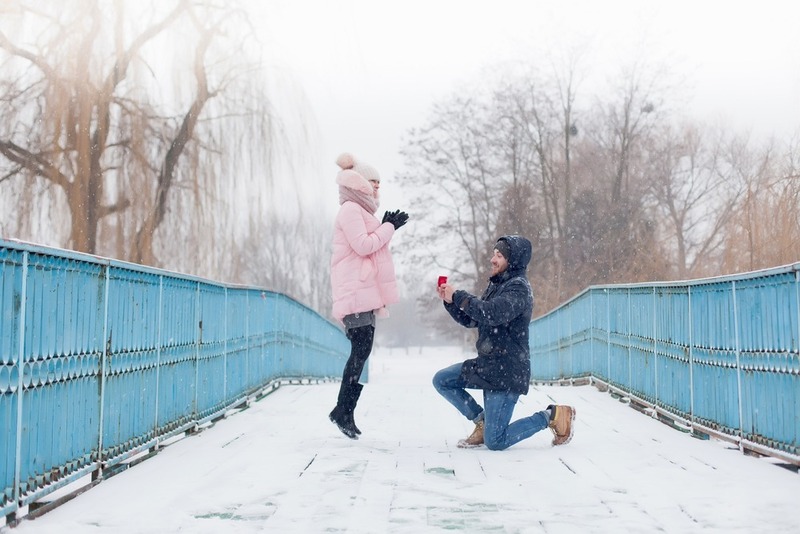 No matter how or when you choose to propose during the holiday season, your engagement story will be the perfect fairytale beginning to your new life. Just remember to snap engagement selfies and post the memories on Instagram. Because your proposal could become the next viral engagement story on the Internet!